Shogi, or Japanese Chess, is similar to chess but has a much larger game tree complexity because of the use of drops. However, like chess, the game can be divided into the opening, middle game and endgame, each requiring a different strategy. The opening consists of arranging one's defenses and positioning for attack, the middle game consists of attempting to break through the opposing defenses while maintaining one's own, and the endgame starts when one side's defenses have been compromised. The basic tactics of shogi are similar to those of chess, involving forks, pins, removing the defender and other techniques, all of which are considered very strong when used effectively. The opening of shogi is generally slower than that of chess, due to the larger board and less mobile pieces. But since a quick offense will leave a player's home territory open to drop attacks as soon as pieces are exchanged, the aim of the opening is to build up defenses for the king, typically by moving the king to the side in a castle with three generals. Leaving a king on its original square (居玉 igyoku or "sitting king") is a particularly dangerous position. Both players can move the rook pawn forward, or, more commonly, advance the pawn above and to the right of the bishop. The former is known as a rook opening and the latter a bishop opening. With a bishop opening, it's common to exchange bishops by having one capture the other. This allows each player to put their newly captured bishop into play anywhere on the board, although care must be taken to avoid weaknesses in defense which may allow for a bishop drop. However, it is not advantageous to exchange bishops if your opponent has a better defensive setup, or more lines of attack. Moreover, making a bishop exchange constitutes one turn loss, so it's not advised without a good reason. 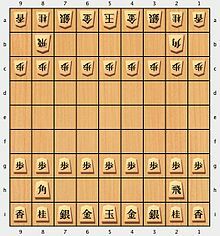 Openings are also classified as static rook (居飛車 ibisha) openings, where the offense is supported by the rook in its original position, and ranging rook (振り飛車 furibisha) openings, where the rook moves to the center or left of the board to support an attack there, typically with the idea of allowing the opponent to attack while arranging a better defense and aiming for a counterattack. However, as the most powerful piece on the board, the rook invites attack, and in most cases, especially for weaker players, it is a good idea to keep the king well away from the rook. Many common opening attacks involve advancing a silver, and ideally a pawn, along a file protected by the rook. This is the climbing silver attack. Because silvers have more possibilities for retreat, while golds better defend their sides, silvers are generally considered superior as attacking pieces, and golds superior as defensive pieces. It is common practice to defend the king with three generals, two golds and a silver. 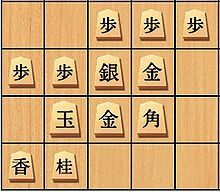 Over many decades, Japanese professional players have all invented various jouseki (定石), which determine moves and sequences which are thought to be the best for a particular situation. It also covers a branch of different variations within an intricate strategy, including alternative options and the certain consequences that some moves may bring. For example, in Double Wing Attack jouseki, it is important for both players to protect the Bishop's head with the Gold, rather than immediately push the Rook pawn again. If either player ignores this, their Bishop may get trapped by a simple pawn drop. Because defense is so important, and because shogi pieces are relatively slow movers, the opening game tends to be much longer in shogi than in international chess, commonly with a dozen or more moves to shore up defenses before the initial attack is made. There are several strong defensive fortifications known as castles. There are many variations and types of castles which can be used, but it is essential to understand which ones are useful in the current situation and how to compensate for its weak points. The Yagura castle (矢倉囲い Yagura gakoi) is considered by many to be the strongest defensive position in shogi. It has a strongly protected king; a well-fortified line of pawns; and the bishop, rook, and a pawn all support a later attack by the rook's silver or knight. It is notoriously difficult to break down with a frontal assault, though it is weaker from the side. It is typically used against static rook openings that involve advancing the rook's pawn. However, one's opponent may just as easily adopt this defense, giving neither side an advantage. There is a good deal of flexibility in the order of moves when building the Yagura defense, and the possibilities will not be listed here. The only point to keep in mind is that the generals should move diagonally, not directly forward. However, there is a strong intermediate position called the kani ("crab"). It has the three pawns on the left side advanced to their final Yagura positions, and on the second rank all four generals are lined up next to the bishop, which is still in its starting position: |B|G|S|G|S| bishop-gold-silver-gold-silver. The king is moved one square to the left, behind the middle silver. While forming the castle, the rook's pawn is often advanced two squares in preparation for a climbing rook assault on the opposing king. Another common preparation is to advance the adjacent silver's pawn square, allowing passage for both the rook's silver and knight. These offensive moves are not properly part of the castle, but the two-square pawn advance must be carried out early if there is to be room for it, and so it is often done while still castling. A common attack against the Yagura defense is to advance the rook's knight directly forward, defended by the rook and with a pawn in hand, to attack the fortifications on either side of the castled king. If the defender has answered a lance's pawn advance on that side, a pawn may be dropped where the edge pawn had been. If the defending silver has moved or is not yet in position, a pawn may be dropped there. A defensive position that is considered easier for beginners, but still popular with professionals, is the Mino castle (美濃囲い Minō gakoi). The King is placed in a safe position, while the three generals work well to back each other up. This is sometimes used when a player chooses a bishop opening rather than the rook-pawn opening. Move the rook to the left side of the board. This move must be first. Move the king to where the rook started, three moves. Move the right-side silver general up one space, so it is now adjacent to the king. Move the left-side gold general diagonally up and right so that it is protected by the other gold general, which has not yet moved. (Optional) Move the edge pawn one square forward. This gives the king an escape route in the endgame. (Optional) Move the fourth file pawn one square forward, so that the left-side gold can be moved diagonally up and right once again. This strengthens the castle against attacks from the front and allows further piece development. In modern Shogi against static rook, the preferred order is to push the edge pawn and build the castle first, before moving the king. If static rook considers Anaguma, then ranging rook has the option of making a rapid attack, while leaving the king on its initial square. If static rook chooses a rapid attack himself, then ranging rook will start moving the king into the castle. A third defense often used in professional shogi is the Anaguma (穴熊 lit. "bear in the hole", and which means "hibernating bear". ), commonly called the "bear in the hole" castle in English (穴熊囲い Anaguma gakoi). This castle can be executed on either side of the board, i.e. either by a player utilizing the ranging rook strategy or by a player employing the static rook strategy. The end-result will place the king in the corner square where the lance started, defended by two gold generals and one silver. This way, the King cannot be easily checked by a knight or a ranging piece. Move the rook to the sixth or seventh file. Move the king to the rook's starting square. Move the lance up one square, then move the king to the lance's starting square. Move the silver general up and right. Move both gold generals to the castle for additional defense. The Boat castle is a static rook castle used against ranging rook, where the king moves next to the bishop and moves the right hand gold diagnoally forward above the king's throne. This castle can also be an intermediary towards making stronger castles, such as Left-hand Mino, Silver Crown or Anaguma. This castle is often considered weak, although static rook has the option of engaging in a rapid attack through various means, especially against 4th file rook and by making use of the left-hand silver. A rapid attack isn't guaranteed to be successful, since ranging rook will try to trade off the bishops and bring the game into a full-scale battle. This can lead static rook into a difficult game, because his Boat castle is too weak compared to the opponent's Mino castle. As such, static rook would rather resort to making stronger castles, such as Anaguma. Professional shogi players tend to evaluate the 'flow' of the game, that is, the sequence of moves leading to the current position and its likely development, much more than chess players. Because pawns attack head on, and cannot defend each other, they tend to be lost early in the game, providing ammunition for such attacks. Dropping a pawn behind enemy lines, promoting it to a "tokin" (gold general), and dropping a second pawn immediately behind the "tokin" so that they protect each other makes a strong attack; it threatens the opponent's entire defense, but provides little value to the opponent if the attack fails and the pieces are captured. Players raised on international chess often make poor use of drops, but dropping is half the game. If a player has more than a couple of captured pieces in hand, it is likely that dropping attacks are being overlooked. However, it is wise to keep a pawn in hand, and often to exchange pieces if necessary to get one. Compared with international chess players, shogi players are more likely to sacrifice pieces, even powerful ones, if the resulting capture can be dropped back into play for a specific purpose. Attacking pieces can easily become trapped behind enemy lines, as the opponent can often drop a pawn on a protected square to cut off the line of retreat. For this reason, rooks, which can retreat in only one direction, are commonly kept at a safe distance in the early parts of the game, and used to support attacks by weaker pieces. However, once the game has opened up, a promoted rook is an especially deadly piece behind enemy lines. Advancing a lance pawn can open up the side of the board for attack. Therefore, when a player first advances a lance pawn, it is common, though not obligatory, for the opponent to answer by advancing the opposing pawn, in order to avoid complications later in the game. It also allows the king to escape if attacked from the side. The collapse of one side's defense marks the beginning of the end game. Once a player has broken through the enemy lines, the opponent's king can be easily trapped by its own pieces. A common last-ditch defensive tactic is to open the pawn line to allow the king to escape. Kings are more difficult to checkmate in the open, especially if the opponent does not have many ranged pieces in play. In the endgame, it comes down to a race over who can checkmate the opponent first. A tactic known as speed counting plays an important role in the endgame. By counting the number of moves until checkmate (assuming the opponent doesn't get to move) for both Black and White, this will help to influence decisions on whether to attack or defend. A simple mistake can change the flow of the game drastically. Among this, there are many other delicate factors to look out for within the endgame, including sacrificial attacks and traps.